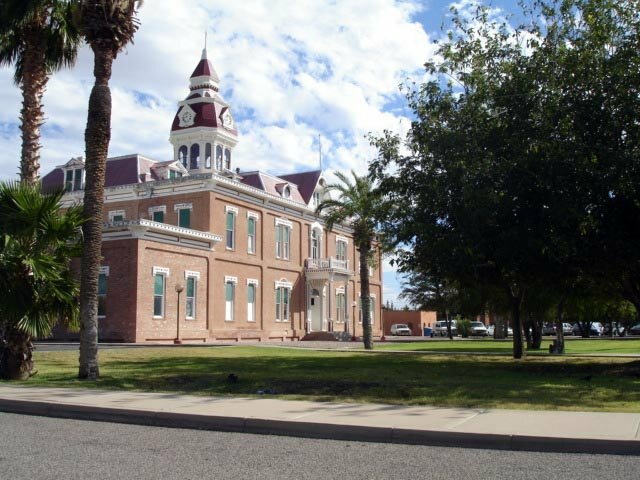 The courthouse was built in 1891 and served as the primary courthouse for pinal county. The courthouse became redundant in the mid 1900's and is today empty and under renovation. we were here working late one night and i was left alone for about 10 minutes, about 4 minutes into being left alone i heard a door shut down stairs and i thought that the guy i was working with was back, so i went half way down the stairs and there was no one there. while i was on the stair-case i could here foot steps above me in the court room. i went back up stairs were i heard another door shut and foot steps down stairs, and the workers there the next night could here the same thing! my cousin refuses to go back in, after about an hour after she left one day about 6 bruises showed up on her arms and legs!